Lots to say this week. My friends Ali and Anna have been on my case about selling my grocery bags. (Each of them has a set I made.) There is a new organic market opening soon in the town just south of us. They know the owners (I know them, too, but not as well), so—unbeknownst to me—there has been a coordinated campaign behind the scenes to make that my first retail outlet. I can’t stand up to that kind of pressure, LOL. I have nine bags ready to go. I’ll talk to one of the owners soon and we’ll see what happens. I now have a pretty good idea of how long it takes me to knock out a dozen bags. I am also changing some of the construction to speed things up a bit. I’ve been making the handles as tubes and turning them inside out, followed by pressing and topstitching, but that takes forever and is hard on my wrists, even using a hemostat. 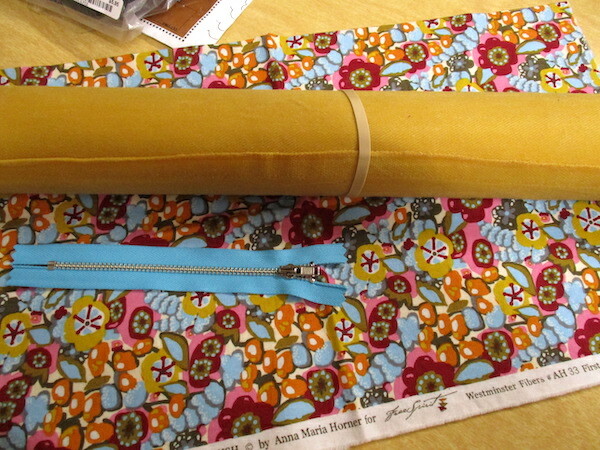 I am going to turn under the edges instead and seam and topstitch in one pass. I love love love the color yellow, but wearing it makes me look like death warmed over. It would work as a purse, though. This is some waxed twill from the same supplier where I get my waxed canvas. I only have a fat quarter of the Horner print (and it’s 10 years old), so I would only be able to use it as the base of the bag. The handles would have to be leather or cut from a different fabric. I am leaning toward leather. My friend Tera came over last night for some advice on a sweater she had knitted—the upper bodice needs some adjustment—and she brought me a wonderful gift! It’s a small quilt kit from Primitive Gatherings, which does wool appliqué designs. She started it but decided that hand embroidery isn’t her thing. I’m thrilled. It will be fun to work on when I have a chance to sit down. And I found out yesterday that Charisma Horton, whose YouTube videos on wool penny embroidery changed my life, is hosting a retreat in Ephrata, Washington in October. I’ve got the information and am planning to sign up. Ephrata is just northwest of Moses Lake. It’s on the Amtrak Empire Builder line, but I’ll probably drive and coordinate with a visit to children. It’s still raining today. Thursday and Friday are supposed to be nice and I want to be out in the garden planting tomatoes and moving lavenders. Next Tuesday, Cathy and I (and possibly Jeryl, our pastor) are heading to Missoula to attend the Montana Berry Growers one-day conference. This should be fascinating. “Presentation topics will include berry orchard establishment, berry varieties, pest, insect and disease challenges, and marketing opportunities for growers.” Maybe I’ll finally figure out how to grow blueberries. The organizers already have had to move the event to a larger venue due to the amount of interest.